FORT GEORGE — A 15-year-old boy was stabbed in the back multiple times on West 184th Street near Audubon Avenue Tuesday afternoon, police said. The victim was attacked by another teen around 3:45 p.m. in front of 524 W. 184th St., police said. He victim was taken to New York-Presbyterian Hospital and was in stable condition, police said. 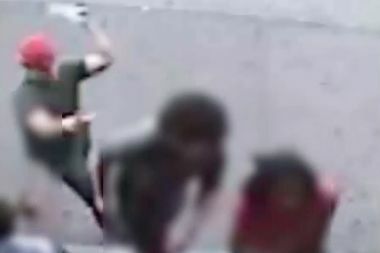 Surveillance video shows the victim standing with at least two other people when a suspect in a red cap runs up and stabs him at least twice in the back. Police described the suspect as 16 to 19 years old, standing between 5-foot-8 and 5-foot-10. He was last seen wearing a red baseball cap and a dark T-shirt, police added.